The film To Serve by the Dutch artists Anno Dijsktra and Jeronimus van Pelt invites its viewers to think about what it meant then and now to desert. What can lead someone to this decision? How do we commemorate those who deserted? Does the military system leave room for autonomous decisions? But as well: what is the moral effect of the use of artificial intelligence within the military system? 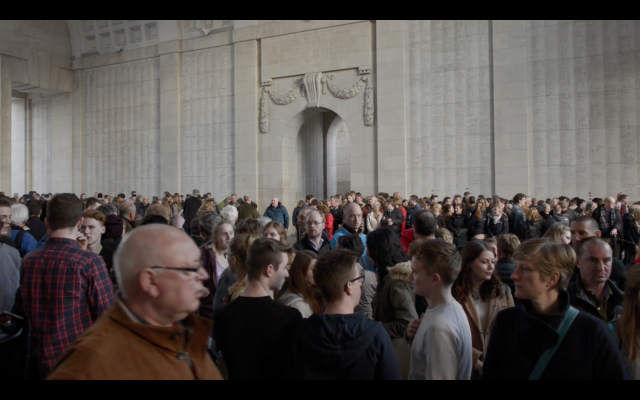 Four international specialists and eight students of the Sint-Janscollege in Poperinge reflect on the complexity of deserting, commemoration and warfare. Militairy historian Julian Putkowski for instance states that we do not belong to only one group. Certain situations can make us decide to change groups. It is a clear explanation of desertion, that immediately illustrates that the themes that which this film deals with are layered and complex. That they can also be full of contradictions is what the example of the inventor of the gas attacks shows us. With his gruesome weapon he wanted to shorten wars and in this way save lives. The mosaic of images in the film was shot in Poperinge and the rest of the Westhoek. Because the technological development of warfare found its origins during the ‘Great War’. In this first industrialized war the opponent was massively disabled using machinery. That development has now come to a point were we can let unmanned vehicles, like drones, perform acts of war. This continuously growing intervention of machines within the military apparatus places the role of the soldier and his heroism or failure in a new perspective. But it also brings up moral questions. 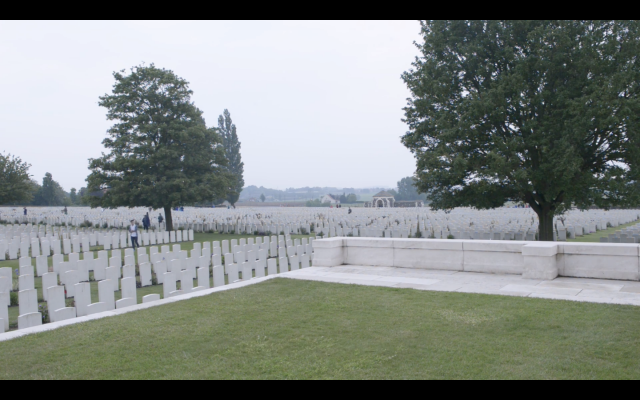 In To Serve everything is reconsidered always keeping in mind the underlying question: ‘What do the things we see, know and live mean today?’ In this respect the images in the film also report on the culture of commemoration. As a consequence of the mass slaughters it has taken on monumental proportions here in West Flanders and people live them day by day. In the exposition Anno Dijkstra tilts our look literally and figuratively as we are watching a classical heroical monument of a soldier on a pedestal, which has carefully been put down. Within this context and that of the film the commemoration in its contemporary form also seems to be questioned again. JP Okay, right. You can start out easily there. Why it’s so very difficult for civilians to understand about the army is, because usually people choose whether to do something or not to do it. That they have liberties. When you join the army you surrender all of your rights. The only right you have is to obey. There is nothing else and that of course is not a right. The job of the officer is to give you an order. The job of the soldier is to obey that order. There are no refinements. There is on nuance about it. And there are no conditions under which you are allowed to disobey those orders. That is true for all armies. RvG But we fuss about it and we just shoot them like deserters. So we call them deserters to set the record straight for the rest of the army. You should not kill them. But on the other hand, if the army wants to be effective, it has to combat the enemy as one and if mutiny were to occur everywhere it would undermine this. So maybe in this case the normal moral considerations are overruled by the idea of presenting a unity, being a unity. PC Private Lynn, buried at ‘Ouderdom’ (now Grootebeek British Cemetery) as an old man, was honoured with the Victoria Cross within the same few days in which private Chase, another member of the same battalion (2nd Lancashire Fusiliers), was sentenced to death and executed against the wall of the Saint Sixtus Abbey in Westvleteren. This shows the same management in discipline. Private Lynn did not run during a gas attack,he stayed behind his machine gun, shot it and died due to the gas. But private Chase ran away because he was suffocating. Well, those who ran formed the largest group, 600 out of 1000 ran away. Should we still discuss this? EB I think it is important, indeed. Assuming the army can play a useful role, well, you can hardly make an army work when everyone can run off at any time. JP The state always has power over all of the citizens within its borders. It has a monopoly of military and police control, otherwise it is not a state. So yes, the sovereign government of any nation state in Europe can require its citizens to do anything. So for most modern people – yes, we do not have conscription all the time. But in emergency it can most certainly be introduced. RvG The only think you could imagine is that no country has an army. You think it is good that there are armies? Should not every country not have an army? I think that that would be impossible to keep up because people come in different kinds. You have good people and bad people. EB Nobody wants to get killed. Would you want to fight for or against something and take such a risk that you could loose your life in the fight? I can image doing this, I can imagine myself doing this against something really bad. That you would take such risks when you would suffer an enormous threath. Just like I can imagine they could be in the homeland. JP There is the one other category which I think is an important one – you don’t belong to one group in life. If you are compelled to choose between your duty to your country – your duty to the army, to your comrades – in a crisis situation and you receive a letter from home that your child is ill, that there has been an accident, your lover or your wife perhaps has left you, your mother has just died, or perhaps your brother or your son has just been killed, then sometimes many of them will say, “My place is with another group.” You don’t belong to one group and your family comes first. Even in the army. EB Yes, this comes really close to home. The group which you obviously fight for is your family. In our law department at the university we sometimes practice this hypothetical case. Torture is never allowed. But image a bomb in a nursery school and you have caught the man who has the code to the bomb and who can tell you where it is so you can dismantle it. Is it okay to torture this man? PC When do you reach for guns? I think it’s in those situations when you realize all attempts to avoid this have been undermined and neglected and there’s nothing left to do. But then still, I think, I see myself as a pacifist, I would consider it a personal defeat. RvG It remains the problem of the scales between the public values, the big values of a country and the personal values. Because the goal of war is to have a good life. But if, as a soldier... you have the idea that your life will never be good again because it is being destroyed at that very moment and you might die anyway and you are sacrificing yourself for others while you believe the war cannot be won. If you are in such a doubt about the desirability of that war then I can imagine you might think: “It leads to nothing and I’d better just quit at it”. But this does not mean you choose something good. JP It is the dream of all generals that all their soldiers will always obey and enthusiastically carry out their orders. But in practice it never happens. We don’t call the protests, protests. We call them mutinies. But very often the officer will not report a mutiny. Why? Because it is an admission that they don’t control the men. They would lose their status if they did so. EB A vote against is not a thing to be afraid of. A vote against is something to protect. It’s funny how human rights function, human rights ask the state to build a mechanism to protect those people that the state will then critize. This is something you can only expect from a robust democracy. It’s a test. You have to be pretty strong to deal with this. You have to organize it yourself. PC Can you honor someone who was executed? The easiest answer to this question is: I don’t know any soldier, at least I have never met one, who would say no to this. It really are not only people who suffered shellshock who were executed during the First World War. Not at all. But it is easy to fail in this very dificult assignment of conducting war. And a monument for the executed is in a way a monument for the extremely difficult assignment the soldiers face in this situation. PC Fritz Haber, the man of the gas attack, said, I am going to make the war more humane, I’m going to create a weapon that can do what the big artillery bombardments cannot do and this will quickly solve the war. Well, the opposite was true, he actually thought up a weapon that has only caused misery and that for many people has perpetuated the agony of war for the rest of their lives. And while this was presented by him as if it was, well, as if it was a panacea which would make the war really short. I see this happen over and over again. Intelligent drones that will shoot when it is necessary because they possess that kind of intelligence. I don’t believe this, because in the end they will be used by people taking the decision. And that decision will be based on bad conflict management. EB It never works completely without the interference of people because someone programs it. It can get to a point where the role of the person behind the AI becomes very small and he is only there at the birth. And then this machine starts leading its own life, creating its own ways of thinking and it actually starts taking decisions. You mainly get a downside, if you think about accountability. Will you make the artificial entity acountable for its actions? If it has taken a decision? Then you will get AI entities that are equal to people. And they might also have rights and duties and stuff. If we are going in that direction, it’s not unthinkable. But I feel more safe in the system where we can track the line back to people. RvG Do you want systems that can kill people or do you want to leave this up to people at all times? I would always choose that last option. Let people kill people because people have a conscience and people can revolt. People can desert. Robots can’t. Deserting is maybe the moral valve of war.